Japanese encephalitis (JE) is a mosquito-borne viral infection, of which pigs and wild birds are the natural reservoirs. It poses public health threats in some South and South-east Asian countries. In Hong Kong, there were 11 local JE cases and 5 imported cases since 2003. Most of the infections were reported in June and July. The hot and humid weather during this period favours breeding of the vector. The map shows the distribution of all reported JE cases in Hong Kong in the past 10 years. 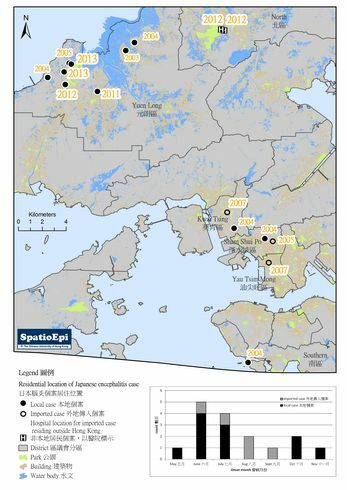 As depicted by black solid dots, the majority were residents in Yuen Long District. Location of all eight cases in Yuen Long were within 2 kilometres of pig farms. Three local cases occurring in areas not in the proximity of pig farms may possibly be explained by their contacts with wild birds or infected mosquitoes brought through air currents. Japanese encephalitis (JE) is a mosquito-borne disease caused by the Japanese encephalitis virus. Most infected cases are asymptomatic while some may develop mild symptoms such as fever with headache. Symptoms usually start at 4 – 14 days after being bitten by an infected mosquito. In severe cases, initial symptoms include quick onset of high fever, headache and neck stiffness, followed by impaired mental state, tremors, occasional convulsions, paralysis and coma. There is no specific treatment for Japanese encephalitis. Supportive therapy is indicated. Case fatality rate ranges from 5% to 35%. Culex species mosquitoes are the principal vector for JE. The mosquitoes become infected by feeding on pigs and wild birds infected with JE virus. The virus is then transmitted to humans through the bite of infected mosquitoes. Humans are dead-end hosts for JE virus. The disease cannot directly be transmitted from person to person. There is a vaccine available for JE but it is not recommended for massive immunization in Hong Kong. Eliminating breeding grounds of mosquitoes and avoiding mosquito bites are two main preventive measures for the disease.